Have You Been to Cheap and Sleazy? Nicholas (Marino) asked me to write an article about my website, cheapandsleazy.net sometime back, and I nearly forgot about it (the deadline was yesterday, in fact! ), but I managed to slap one together. Hope you like it! A few years ago, after finishing up a certificate in Technical Writing and another in Web Design and Development and finding no work thanks to the "Dot-Bomb" and 9-11, I found myself trying to find a new career path that couldn't be adversely affected by market conditions, as the tech sector had been at the time. That pretty much left me with two fields to choose from: Medical or Legal. Medical was a big no-go for me! Why, you ask? Because the medical field is full of sick people! Who needs that?!? That left the legal sector. By this time I had been working for a court reporting agency, transcribing audio- and video-taped court proceedings for a few years, and my boss had told me that I really should look into becoming a court reporter. "You'd be really good at it," she told me. Unfortunately, she neglected to talk about the money, and at the time, I was enthralled by a book called "How to Make $100,000 a Year as a Technical Writer," so I decided to finish the technical writing certificate program I was in. A couple years later, the combination of being out of work and NOT wanting to work in the medical field made me stop by Seattle's Court Reporting Institute with a manual writer I had borrowed from my job and ask if I could try the school out for a couple of days. The school owner made me a better offer: Fill out the paperwork to start school, and at the end of two weeks, I could sign the papers and continue, or we'd tear up the papers and I'd be on my way. I tried it for the requisite two weeks ... and liked it. It didn't take long before I noticed several of my new classmates had trouble using the computers in the lab, not to mention their personal laptops, so I put together a Microsoft Word document called "Got Fear?" which basically consisted of all sorts of tips and tricks to help the nervous computer user be a little more relaxed while working with the computer. I then printed out a copy for anyone whom I felt could use the assistance. Soon it became time for me to either continue renting the manual writer from my school, or bite the bullet and buy my own. At the time, my school was recommending that all students buy the student version of Case Catalyst (~$500) and a Stentura 400 SRT, which is a student writer -- which means it could only hold 50 pages in memory, just like the student version of Case was limited to only 50 pages. Having used both the software and hardware in the school's lab and been less than impressed, I decided I should look through that large stack of JCRs (The Journal of Court Reporting; http://www.ncraonline.org/jcr) at my job and see what else was out there ...! Soon I hit the jackpot and found CAT software for US$45 (digitalCAT; http://www.stenovations.com/digitalcat/professional) and a place that sold refurbished writers ... specifically, a ProCAT Flash that I picked up for about US $1700 or so, and a rather crappy laptop I bought from a local store for US $1,000. 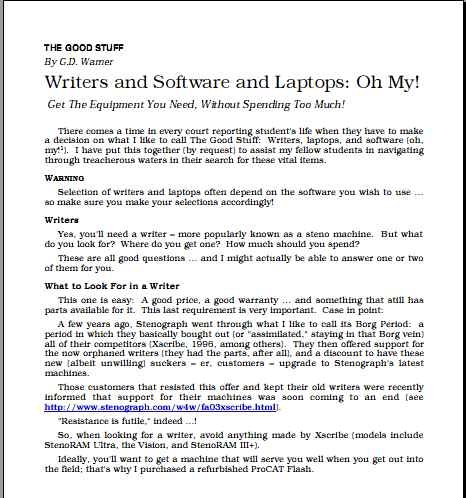 Both the writer and the software were good buys: The software did (almost) everything the professional version did, and the Flash was a professional-level writer, so I would never have to worry about getting hit with the big surprise bill that comes due when one finishes court reporting school for buying a new professional writer and the professional version of your CAT software ... which could easily reach US $9,000 or so. Eventually all that research became another Word document called "The Good Stuff" (yes, I know -- crappy title! ), and I would hand it to anyone who said they were thinking about buying a new writer. It took me a while, but eventually I decided to take my cable company up on their kind offer of hosting websites for their customers -- for free! That was the beginnings of what is now Cheap and Sleazy. I converted and expanded "The Good Stuff" document into XHTML and posted it in July of 2004, and followed it with "Got Fear?" a month later. At that time, I was on several of the court reporting forums: Depoman, The Compuserve Court Reporters Forum, the The Eclipse Forum, the (now gone) digitalCAT forum, and the (also gone) Steno Life forum, to name a few. From those forums, I picked up a *LOT* of knowledge, and continue to do so to this day. That knowledge came in handy when a local captioner came to visit our school, because when she asked if anyone had any questions, no one apparently knew what to ask, so I asked her some questions, some of which she was hard pressed to answer! She visited the school twice, speaking to both the day and night classes (I was in night class), and I sat in on both sessions and wrote up the notes and uploaded them to my nascent website as the third article. That one was called "CRI Seattle Guest Speaker Erin Duncan: Captioner," and had the subtitle of "Everything You've Ever Wanted to Know About Captioning ...."
I'm not sure, but I *think* I wrote those up as a Word document, and handed them to students who missed her visits. I later converted the document and uploaded it to the still nascent Cheap and Sleazy, but the create date in the .html file says I did that nearly a year later! Once I got out of theory, one of my new speedbuilding classmates had purchased a Gemini. She was not shy about letting people try it either, as she was extremely happy with her purchase! It took some begging and pleading, but I finally convinced her to write a review for my nascent website. That first article was the first article on the site that wasn't written by me. She wrote that and two more later on -- one in response to a * LOT *of complaints about that second article. I must confess -- the site was ugly. The colors were -- well. I'll spare you the gory details; just trust me when I tell you the site was Ugly (note the capital U). Oh, wait -- I found a picture! The Web Design and Development program I was in didn't emphasize cascading style sheets ("CSS") beyond telling us what they were and how to use them, with a little basic homework thrown in. For those of you who don't know, cascading style sheets are either lines of code within the HTML code for a page or an external text file which specify how a page on a website should look ... that is, it includes information about which font to use, the size, amount of indentation, etc. If youâ€™ve ever been to Cheap and Sleazy, you probably noticed that all of the articles have the same "look and feel." This is due to a style sheet I created based on the article template the editors at the magazine, "MacTech" have their writers use. I took that document template and updated it, so that the paragraphs change at the appropriate times when I hit the Enter key. I used to use it to write articles for MacTech, and am using that same template to write this article, in fact! Fortunately, my Web Design and Development instructors did teach us enough about CSS for me to create a style sheet based on that (or any) Word template, and that is what I use for the articles on Cheap and Sleazy to this day. The look and feel for the rest of the site comes from a web design program I downloaded a demo of a few years back. It would only create two pages until I bought the program, so I took those two pages and copied their content into my HTML editor, changing them to accommodate the desired content of the other pages. I use those for the main page, all the archived pages, the Links page, and the page for the Drill Machine. Unfortunately, shortly after making that mockup of the new home page, I had to move ... and my cable company wasn't able to come with me! I took my income tax refund and paid for web hosting services on Brinkster.com. Over the years, I have added quite a bit to the site: Several articles written by myself and others (which I later added under that "Index" heading on the left in the picture above), along with a kinda-sorta blog, where I wrote about what articles were in progress, tips I picked up from here and there, and (believe it or not) a couple of recipes! Thus far, the main page has been archived seven nine times. What that means is that every year or so, I cut (almost) everything I wrote on the main page and paste it all into a new archive page. If I didn't do that, the Index page would be well over five hundred pages by now! A few years ago, I got an offer from my hosting company to add a Stats package. 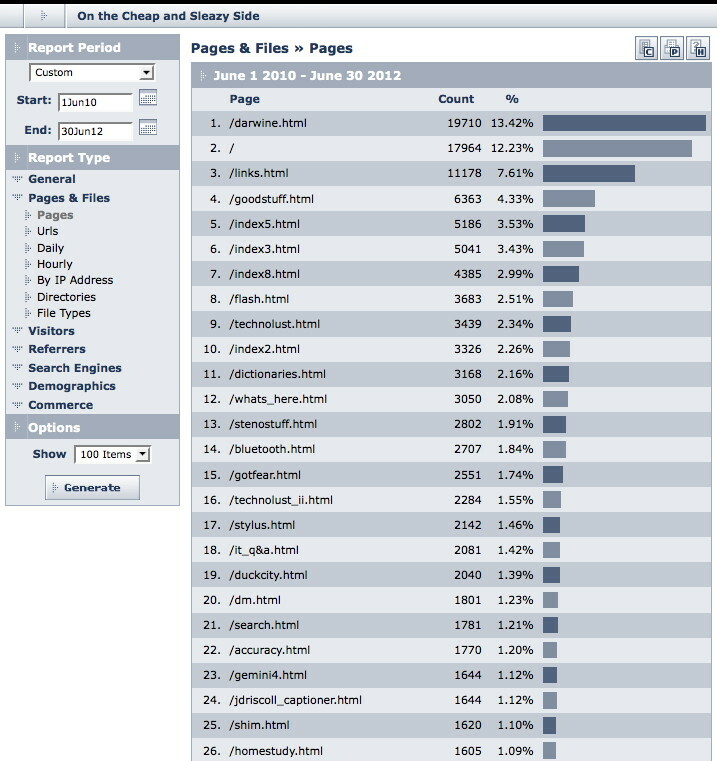 This allows me to see what people are reading on Cheap and Sleazy, what they were searching for that brought them to the site, all sorts of interesting stuff. They show that the an article I wrote about running Windows applications on a Mac ... without needing to install Windows (see "A Wee Bit About Darwine" at http://www.cheapandsleazy.net/darwine.html) and the Index page are consistently the top two most popular pages on the site. I have a LOT of articles in the planning stages! There's one I've been working on that shows the reader how to watch TV on their computer using a web browser, an add-on for the browser that will download the video, and a program called VLC to watch the downloaded video. This one has hit a bit of a snag, in that I have to list step by step what to click and not to click, lest my Windows-using readers pick up some virus or trojan ... but I'll find a way (and the time!) to finish the article. Another is an article on why court reporters should be on Facebook. Some years ago, I came up with an idea to have users of the various CAT software out there write an article for my readers, telling them why they use the CAT they use, what they like, what they dislike, what feature they wish their CAT of Choice had that it does not, etc. ... in short, they were to imagine they were sitting across from a student or a fellow reporter and tell them what they like and dislike about their CAT software. Thus far, I have three articles in-hand, with lots of promises for others, but so far, no actual articles have appeared in my Inbox. I did ask Mike "Depoman" Miller if he would write the piece for Case Catalyst, and at the time, he was crazy busy working on the Realtime System Administrator course. "Dude, my upcoming schedule: Fly to DC tomorrow to teach the RSA, leave Saturday as soon as the RSA is over, fly to San Francisco for the DRA conference, presentation on Sunday, leave Monday AM for Korea through the 9th, spend the next week moving my inlaws into a nursing home, leave that Saturday for Manchester, UK for deps through the end of the month, then go to GTMO for the month of April." "Would love to write it, but just don't see how. If I break my arm, I'll letcha know." I haven't heard back, but it appears as though Mike is in good health, so I'll have to find someone else to write the Case article. Anybody out there use TeLiTor? If so, I could use an article on that one! Please stop by Cheap and Sleazy. There are no ads, just good steno info. Fair warning: You might want to grab a snack and a beverage before looking around on the site! Otherwise you're sure to lose an hour or two. Wow, eight pages! Sorry about that, Nicolas!